Have you ever met someone who is the exact same as you? I haven’t! We all have different personalities with different likes and dislikes. Gray Ratsnakes are like that too! Gray Ratsnakes are creatures of habit so they like to hang out in the same places time and time again. This is especially true during the winter months. Gray Ratsnakes hibernate during the winter and so they find a place underground, below the frost line. These places are often in deep rock crevices and they will use the same overwintering site year after year. Gray Ratsnakes also have preferences when it comes to their day-to-day lives during the summer. More knowledge has been gained about this through monitoring being done at Murphys Point Provincial Park. The Gray Ratsnake Monitoring Technician has been tracking 6 adult male snakes using radio transmitters. The goal of the monitoring is to find where these snakes spend the winter. But in the meantime the technician has learned what each snake likes to spend its time. One Gray Ratsnake that is being tracked, who is referred to as ‘850’ or “Chip”, likes to move around a lot and doesn’t stay in one place for too long. Chip was first found in Ash Hill campground but he didn’t stay very long! 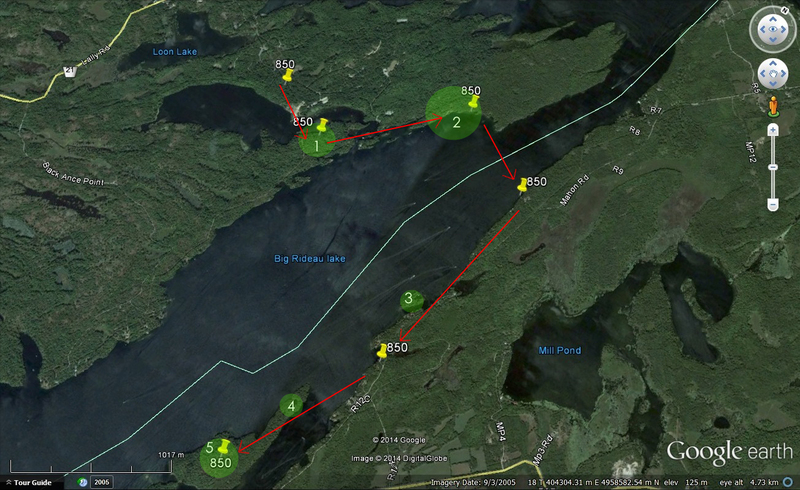 He then travelled across Hog Bay to eventually crossing the Narrows of the Big Rideau and spending time along the shore which is indicated in green on the map. Chip has travelled as much as 1.5km in one day throughout his travels! One of the other snakes that is being tracked is very different from Chip. He is referred to as ‘150’ and he likes to hang out in old farmstead buildings and does not like to travel far from the old farmstead. In fact he mainly stays inside one of the rotten logs of the farmstead. Even though these two Gray Ratsnakes are the same species, they are different from each other in how they spend their days. Chip “850” and his movements.